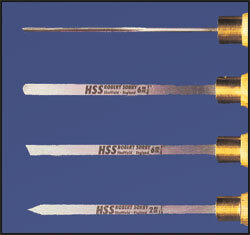 These smaller Sorby Micro Tools are perfect for smaller work on mini lathes. They are all made of M2 high speed steel and have 6-1/4" Ash Handles. The tool length is 4-1/4", the overall length is 10".